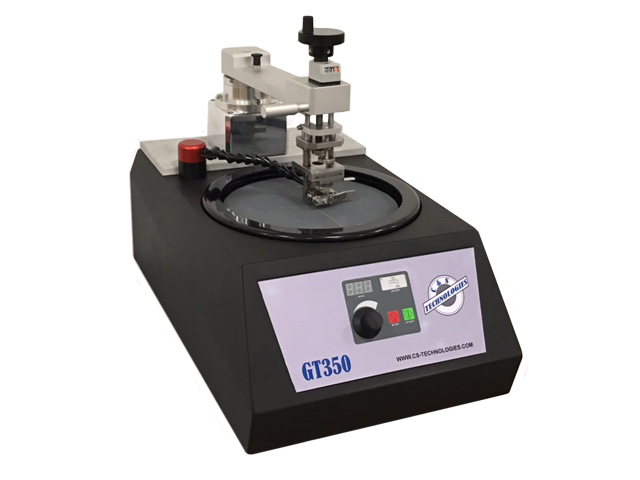 The GT350 grinder polisher is used to process a variety of cross section samples including battery terminals and epoxy samples. Epoxy samples include IDC crimps, longitudinal crimp cross sections, ultrasonic welds, ultrasonic splices, and cable samples. Samples are mounted in the appropriate sample holder. Next the sample is cut or milled with our FC 4001 power saw. Next the sample (still mounted in the sample holder) is moved to the GT350 for grinding and polishing. Next the sample (still mounted in the sample holder) is placed under the microscope for final cleaning with etching solution and picture taking. GT350 is an upgrade from the now obsolete CST-03 grinder polisher. The sample holders from CST-03 grinder polisher will work with GT350.